You'll be hard pressed to find a convention center as scenic and close to the action as the Tampa Convention Centre. Right on the water's edge, you'll enjoy the best of both worlds as you promote your business using our signature trade show displays and exhibition solutions. When you're done making your mark at the convention center, unwind with a walk along the Tampa Riverwalk and see why people flock from all over the country to see this jewel in the heart of Florida! The success of a trade show can greatly impact a product or service. If a trade show goes well for a product or service, then it can launch the product or service into greatness. Where is the Tampa Convention Center Located? The Tampa Convention Center is located at 333 S Franklin St, Tampa, FL 33602. It is located in downtown Tampa with both water views and skyline views! What Are the Different Forms of Displays? There are several displays that can be used at a trade show. These displays all have their own benefits and can be effective at promoting products or services. 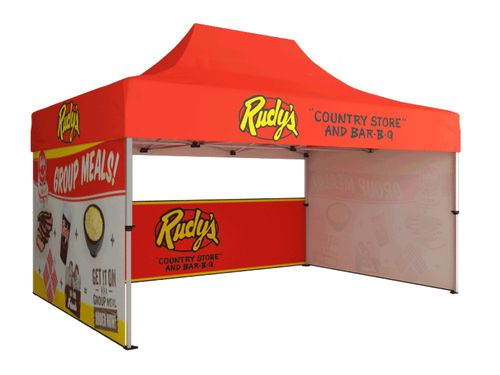 The ways to display a product or service are with pop up displays, 10x10 booths, retractable stands or portable exhibitions. If you are trying to make a product or service successful and you don't have a set of goals, then it is doomed to fail. It is crucial to find out what your goals for your product or service are and then to work towards them. Once you know your goals, then you should use your trade show display to help meet them. For example, if your company sells jewelry products then you should incorporate images of your jewelry on your display and have pieces of jewelry there for people to see. Using your display to help meet your goals is a great way to have a successful trade show. The way you promote your trade show display depends heavily on the product or service you are promoting. For example, if you are promoting a cologne then putting flyers up near a fine dinning restaurant is likely a good idea. Putting these same flyers up near a baseball field will likely not be a good idea because a lot of people who are playing baseball aren't focused on how they smell. No matter how you promote a product or service, doing so before a trade show will undoubtedly help your product or service's performance at the trade show.